Saturday brought with it a new cleaning schedule. My hubby & I agreed we would start sharing cleaning tasks & always do them on a Saturday so this week appears to be a week of new things. So as I spent my time cleaning I didn't actually leave the house but hubby managed to. So he was out with the boy & tagged me in the photo so I figured it had to be included. Apparently it was a nice day outside but as I say I managed to remain in my pjs. 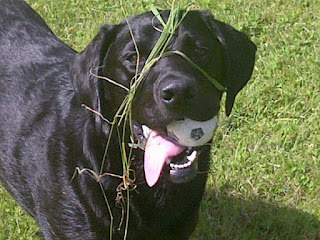 Bailey had fun though, treasure hunting for a ball. You can see the smile on his wee face. So hoovering was my task. I do enjoy getting the carpet clean with a cream carpet & a black dog, it's very obvious when it's been done. Good for the soul, if not the soles of our feet. As I said I am still playing with Instagram, so excuse the random space age filtered shot. Anything to make the hoovering seem more exciting! Then we have another exciting photo, my scarves drying. I have a vast selection of scarves, I wear one most days, so today with the sun in the sky I decided to give them all a freshen up. My rocking chair! Old before my time, that's me. I have fond memories of rocking in a chair just like this when I was young. So when my dad found me this one, I was so happy. I got it around the time I started trying to meditate, so it was perfect for my meditation corner. I must admit since I've went back to work I have found very little time to just sit in my chair. So tonight after this exciting post (Sorry I am a bit sarcastic tonight) I plan to go to my corner & enjoy rocking away the first Saturday of August. Thanks he's my pride & joy! Yeah my hubby is definitely the cleaner in this relationship, suppose it's got to be done! & bonus was we got a last minute viewing for our flat today so because we had a routine clean on Sat it was much easier to get things ship shape for the viewing! My name is clarejbrown on instagram, just watch though I'm still playing with it so uploading stuff like hoovers & rocking chairs!! Not quite as pretty as your dresses!